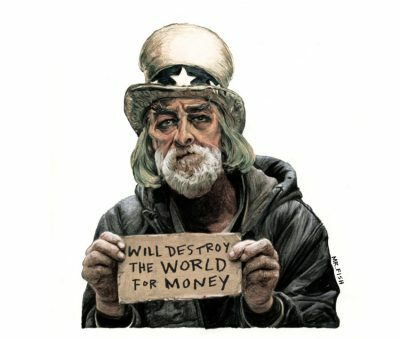 The empire will limp along, steadily losing influence until the dollar is dropped as the world’s reserve currency, plunging the United States into a crippling depression and instantly forcing a massive contraction of its military machine. Under every measurement, from financial growth and infrastructure investment to advanced technology, including supercomputers, space weaponry and cyberwarfare, we are being rapidly overtaken by the Chinese. “In April 2015 the U.S. Department of Agriculture suggested that the American economy would grow by nearly 50 percent over the next 15 years, while China’s would triple and come close to surpassing America’s in 2030,” McCoy noted. China became the world’s second largest economy in 2010, the same year it became the world’s leading manufacturing nation, pushing aside a United States that had dominated the world’s manufacturing for a century. The Department of Defense issued a sober report titled “At Our Own Peril: DoD Risk Assessment in a Post-Primacy World.” It found that the U.S. military “no longer enjoys an unassailable position versus state competitors,” and “it no longer can … automatically generate consistent and sustained local military superiority at range.” McCoy predicts the collapse will come by 2030. Historians of empire call these military fiascos, a feature of all late empires, examples of “micro-militarism.” The Athenians engaged in micro-militarism when during the Peloponnesian War (431-404 B.C.) they invaded Sicily, suffering the loss of 200 ships and thousands of soldiers and triggering revolts throughout the empire. Britain did so in 1956 when it attacked Egypt in a dispute over the nationalization of the Suez Canal and then quickly had to withdraw in humiliation, empowering a string of Arab nationalist leaders such as Egypt’s Gamal Abdel Nasser and dooming British rule over the nation’s few remaining colonies. Neither of these empires recovered. Empires need more than force to dominate other nations. They need a mystique. This mystique—a mask for imperial plunder, repression and exploitation—seduces some native elites, who become willing to do the bidding of the imperial power or at least remain passive. And it provides a patina of civility and even nobility to justify to those at home the costs in blood and money needed to maintain empire. The parliamentary system of government that Britain replicated in appearance in the colonies, and the introduction of British sports such as polo, cricket and horse racing, along with elaborately uniformed viceroys and the pageantry of royalty, were buttressed by what the colonialists said was the invincibility of their navy and army. England was able to hold its empire together from 1815 to 1914 before being forced into a steady retreat. America’s high-blown rhetoric about democracy, liberty and equality, along with basketball, baseball and Hollywood, as well as our own deification of the military, entranced and cowed much of the globe in the wake of World War II. Behind the scenes, of course, the CIA used its bag of dirty tricks to orchestrate coups, fix elections and carry out assassinations, black propaganda campaigns, bribery, blackmail, intimidation and torture. But none of this works anymore. The loss of the mystique is crippling. It makes it hard to find pliant surrogates to administer the empire, as we have seen in Iraq and Afghanistan. The photographs of physical abuse and sexual humiliation imposed on Arab prisoners at Abu Ghraib inflamed the Muslim world and fed al-Qaida and later Islamic State with new recruits. The assassination of Osama bin Laden and a host of other jihadist leaders, including the U.S. citizen Anwar al-Awlaki, openly mocked the concept of the rule of law. The hundreds of thousands of dead and millions of refugees fleeing our debacles in the Middle East, along with the near-constant threat from militarized aerial drones, exposed us as state terrorists. We have exercised in the Middle East the U.S. military’s penchant for widespread atrocities, indiscriminate violence, lies and blundering miscalculations, actions that led to our defeat in Vietnam. The brutality abroad is matched by a growing brutality at home. Militarized police gun down mostly unarmed, poor people of color and fill a system of penitentiaries and jails that hold a staggering 25 percent of the world’s prisoners although Americans represent only 5 percent of global population. Many of our cities are in ruins. Our public transportation system is a shambles. Our educational system is in steep decline and being privatized. Opioid addiction, suicide, mass shootings, depression and morbid obesity plague a population that has fallen into profound despair. The deep disillusionment and anger that led to Donald Trump’s election—a reaction to the corporate coup d’état and the poverty afflicting at least half of the country—have destroyed the myth of a functioning democracy. Presidential tweets and rhetoric celebrate hate, racism and bigotry and taunt the weak and the vulnerable. The president in an address before the United Nations threatened to obliterate another nation in an act of genocide. We are worldwide objects of ridicule and hatred. The foreboding for the future is expressed in the rash of dystopian films, motion pictures that no longer perpetuate American virtue and exceptionalism or the myth of human progress. “So delicate is their ecology of power that, when things start to go truly wrong, empires regularly unravel with unholy speed: just a year for Portugal, two years for the Soviet Union, eight years for France, eleven years for the Ottomans, seventeen for Great Britain, and, in all likelihood, just twenty-seven years for the United States, counting from the crucial year 2003 [when the U.S. invaded Iraq],” he writes. Many of the estimated 69 empires that have existed throughout history lacked competent leadership in their decline, having ceded power to monstrosities such as the Roman emperors Caligula and Nero. In the United States, the reins of authority may be in the grasp of the first in a line of depraved demagogues. “For the majority of Americans, the 2020s will likely be remembered as a demoralizing decade of rising prices, stagnant wages, and fading international competitiveness,” McCoy writes. The loss of the dollar as the global reserve currency will see the U.S. unable to pay for its huge deficits by selling Treasury bonds, which will be drastically devalued at that point. There will be a massive rise in the cost of imports. Unemployment will explode. Domestic clashes over what McCoy calls “insubstantial issues” will fuel a dangerous hypernationalism that could morph into an American fascism. A discredited elite, suspicious and even paranoid in an age of decline, will see enemies everywhere. The array of instruments created for global dominance—wholesale surveillance, the evisceration of civil liberties, sophisticated torture techniques, militarized police, the massive prison system, the thousands of militarized drones and satellites—will be employed in the homeland. The empire will collapse and the nation will consume itself within our lifetimes if we do not wrest power from those who rule the corporate state. Featured image is from Mr. Fish.